Some of the best fishing on the lake can be found right here in our quiet, no-wake cove. 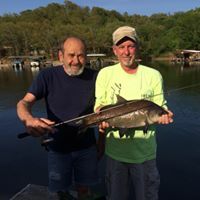 Fishing fanatics of all ages will love the fishing here at Skyline Resort, from the monster catfish and trophy bass to the best eatin' crappie around. 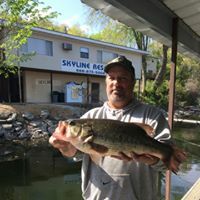 We have an enclosed fishing dock for your enjoyment (for Skyline Resort guests ONLY - no day fishing). We help get your boat in and out of the water and, and we have plenty of ice to keep the beer, soda, and fish cold. 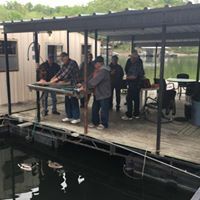 Some of the nation's best fishing tournaments are right here on Lake of the Ozarks! Including the Big Bass Bash.